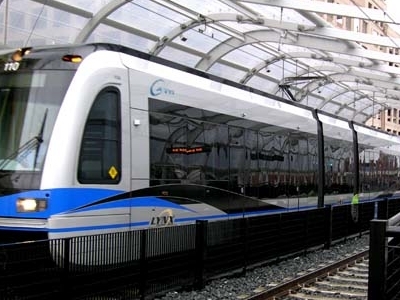 The Charlotte Transportation Center/Arena station or CTC/Arena station is a light rail station for both the LYNX Blue Line and the historic Charlotte Trolley in Uptown Charlotte, North Carolina, U.S.A.. The station officially opened for service on Saturday, November 24, 2007, and as part of its opening celebration fares were not collected. Regular service with fare collection commenced on Monday, November 26, 2007. The station is located at East Trade Street between Brevard Street and College Street. It has side platforms, which sit on either side of the tracks. Additionally, the station has an entrance from the platform into the neighboring Charlotte Transportation Center. The station is unique to the LYNX system in that the entire platform is covered by a roof made of synthetic materials and supported by curved steel. The present design was originally scrapped due to high costs, but was later brought back and constructed after multiple Uptown businesses donated money to make up the difference in construction costs. As part of the CATS Art in Transit program, the CTC/Arena features several pieces intended to provide a better overall aesthetic for the station. The works include bas-reliefs entitled Gingko by Alice Adams, drinking fountain basins designed to look like dogwoods, the North Carolina state flower, by Nancy Blum, the Trade Street bridge supports entitled Bobbins pays hommage to Charlotte's textile industry was created by Andrew Leicester, Bobbins and track fencing featuring cottonwood leaves by Shaun Cassidy. Here's the our members favorite photos of "Metro Stations in Charlotte". Upload your photo of Charlotte Transportation Center Arena!